While revising SHADES OF THE PAST, set in the English countryside in 1882, a startling thought occurred to me. My heroine, Vanessa, undoubtedly rides sidesaddle and I had not accounted for that. At various times, Vanessa is tossed from her horse, required to mount hastily, and, in one scene, purposely casts herself off her horse’s back, lest the villain trap her. How secure is she atop her sidesaddle? I wondered. Surely, with both legs on one side of the horse, it’s a simple matter to dismount. (Wrong.) Just what is going on beneath Vanessa’s skirts and how does the design of a sidesaddle differ from one ridden astride? The answers proved challenging to pin down at first. Understanding what a “leaping horn” is and how a lady was to arrange her legs and position her feet was another matter entirely. The Internet came to my rescue with such wonderful resources as the “Side Saddle Lady Museum” with its historical overview of sidesaddles and riding habits; and the “American Side Saddle Association” offering specific instructions on how to mount, ride and cue a horse with both legs on one side, plus how to safely dismount—not a straightforward task with two fixed pommels and leaping horn in the way (not to mention the lady’s gown that could get snagged in the process!). Once upon a time, sidesaddles possessed only a single pommel, aiding m’lady little should she start slipping from her perch. In the 16th century a second pommel was added, giving the rider more security and control over her horse. Now, while sitting squarely on the horses back, she could place her right thigh in front of her, through the two pommels, and wrap her leg around the near-vertical left horn. The greatest advancement, however, occurred in the 1830’s thanks to the Frenchman, Jules Pellier. His design added a third lower pommel, the “leaping head” which was slightly movable and curved over the rider’s left leg (while her foot rested in the stirrup). With this added security she could join in the hunt at a full gallop and leap fences as well. So how does one mount a sidesaddle? 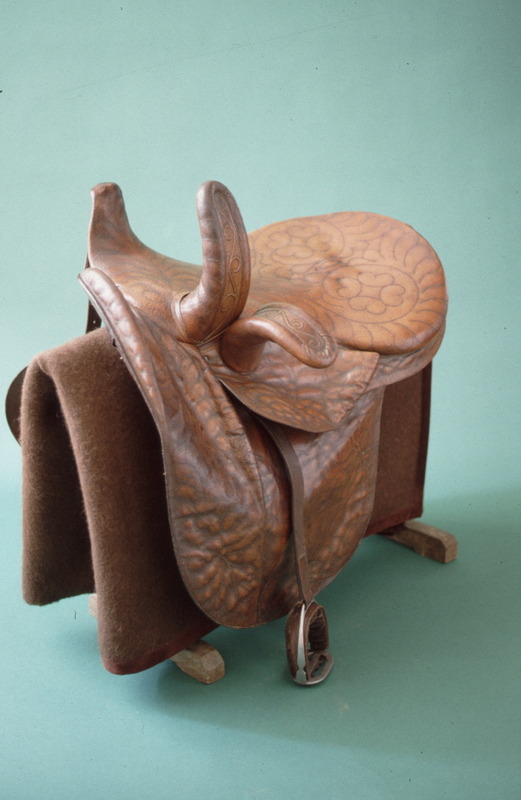 The stirrups (which hang on the same side) are shorter and there is the problem of pulling the saddle off center while mounting. A groom is of great help, as is a mounting block. In my heroine’s case, she had neither at her disposal. While I chose not to specifically show her mount by a stand of trees, I envisioned an old tree stump served her purposes. Dismounting was the greater challenge as, beneath Vanessa's skirt, she needed to free both feet from the stirrups. lift her right leg over the larger pommel and then free her left leg from the leaping head, all without notice of the villain before she cast herself off her horse and onto the ground. It was a tricky piece of business but, heroine that she is, she managed it. Enjoy the following links giving full explanations and information on the ins and outs of riding sidesaddle, plus sources and patterns for period riding habits. Particularly enjoy, Belle Beach's Riding and Driving for Women, published in 1912 and free for download as a pdf from Google. 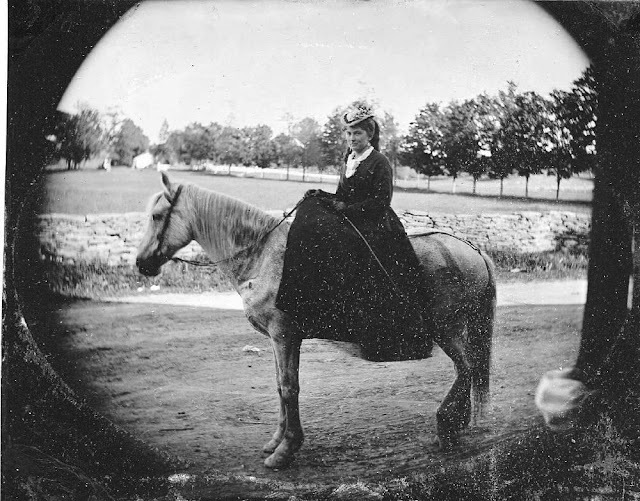 Belle Beach was an accomplished horsewoman in her day and gives a thorough and excellent treatment of the subject of riding sidesaddle in her volume, plus also of how to drive a carriage. Looks cumbersome and dangerous to me. 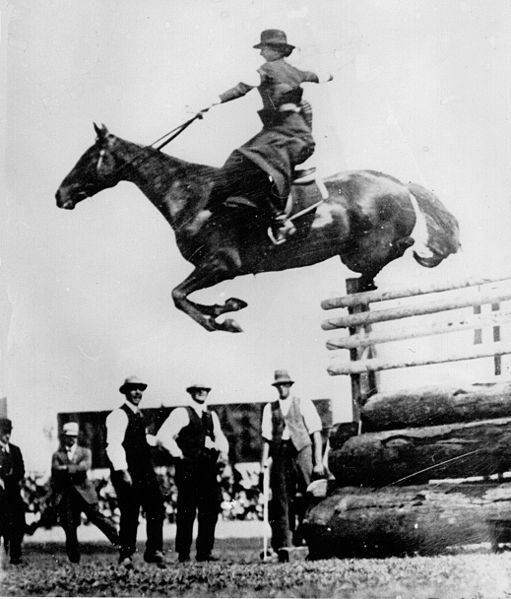 Combine this piece of equipment with a corset restricting movement of the torso, and it seems impossible that a woman could ride at all, much less clear 6'6" as in the photo. She must have descended from centaurs.